I am proud to be the father of three strapping boys with refined senses of humour and highly developed quantitative and scientific skills, as well as the doting husband of one of the decorative arts world’s leading lights. I manage fixed income portfolios for a living. I consider myself a contrarian value investor. I’ve had a varied career, starting as a banker, and doing some time as a divisional Chief Operating Officer when I wasn’t in the investment business itself. No, I mean in your free time! I like to ride bikes, fly kites, run (less and less), listen to jazz and classical music, read, and sit around in the country. You aren’t doing any of those right now. Why do you have this site? Well, I wouldn’t want anyone else to have it. Sometimes I want to learn and write about something instead of discuss it at a cocktail party or snark on Facebook. I’m just nerdy that way. Society (the press, social media, people at cocktail parties) doesn’t know how to interpret data very well. You’ll see me write about taxes, wealth and income inequality and flows and stocks of the economy trying to untangle the data. Is it for someone else, or for me? I don’t know. It feels good to understand the source of radically different narratives that you hear about modern life and the human condition. I’m interested in bias and how people make decisions. I believe that people are overconfident and wonderfully flawed decision-making machines. In my professional life I’ve had to think about ‘hacks’ for better decision-making – things like checklists, generating a counter-thesis, reasoning back from the opposite outcome, puncturing certainty, pre-commitment, and locating apparent contradictions. I link to economic/financial/investment articles that relate to these topics, and I love to highlight contradictory reasoning. For instance, how attitudes towards GMOs, climate change and various conspiracy theories are highly inconsistent but driven by politics and group loyalties (it is often necessary to express belief in a group’s most ridiculous belief to demonstrate in-group solidarity). Sadly, I feel compelled to link political commentary, because it is so fraught with decision-making traps and biases, and because the politics of the people around me are generally different from my own. I note that I am far from immune from these biases, but I tend to find certainty, alarmism and moral posturing provocative, since they are almost always unjustified. Politics, as Eliezer Yudkowsky says, is the mind-killer. My own politics lean libertarian. I value individual liberty (normatively) and I believe people in groups make far worse and more oppressive decisions than markets, as fallible as markets are. It is human nature to fall into the relentless destructive power of bureaucracy, even with the best of intentions. I am a bit of a reflexive contrarian in any context. I was also Chairman of Learning Ally for six years (2008-2014). So you’ll see me writing/tweeting about accessibility, early diagnosis of dyslexia and related matters. Can you give me some investment advice? No. If you want to be wealthier, develop some behavioral hacks for saving money. My grandfather was a collector/curator. 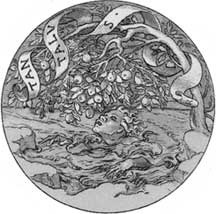 Among his many purchases was a Holbein illustration of the Greek Legend of Tantalus. He identified with Tantalus, seeing himself as always striving to make the ultimate purchase or build the ultimate collection, but never quite able to finish or rest. As he did with many of the works he loved, he commissioned reproductions of it to mark some of his own books and possessions. 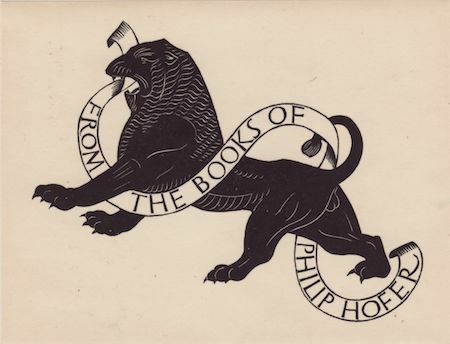 The logo above is a scan of his own reproduction, on which he added his own initials. Here it is, along with another striking book mark he made. I share my grandfather’s packrat tendencies. For some reason, when I surf the web, I’m driven to assemble, curate, and comment on the articles I find for posterity. Like him, I find I am never quite done. 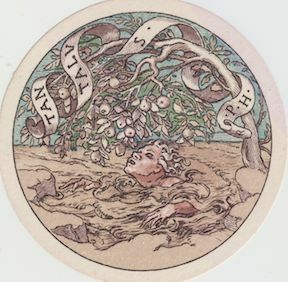 The quote below the logo (“Heaven is what I cannot reach”) is from an Emily Dickinson poem referencing the Tantalus legend.